Dentures in Cocoa Beach are always customized to fit your mouth as closely as possible. 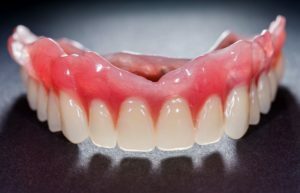 When you’re getting used to a partial denture, adjusting to it can be awkward at first. That’s why a dentist is prepared to give you a comprehensive list of tips and tricks to follow that makes adjusting to your new smile easier than ever. To learn what to expect in the first few weeks and how to care for them, keep reading! It’s essential that you follow all of your dentist’s instructions after your denture is fabricated. They’ll explain how long the denture should be worn for and when it needs to be removed. In some cases, you may be asked to wear your denture all the time in order to help the dentist determine where adjustments are needed. If you experience sore spots in your mouth, they’ll make adjustments, then likely ask you to remove the denture before bed and replace it in the morning. Dentures will feel awkward at first and placing them in your mouth will take a little practice, but this is normal for all new denture owners. As you become used to wearing it, start by eating soft foods that are cut into small pieces. Try to chew the foods on both sides of your mouth to keep the denture as even as possible. Avoid foods that are very sticky or hard to prevent accidentally unseating them. If you notice problems with speaking, practice reading out loud and repeating words that are more difficult to say while wearing your denture. Start by purchasing a denture cleaner recommended by the American Dental Association. These products hold a seal on the back of the packaging and can be found in nearly any pharmacy or grocery store. Make sure to purchase a soft-bristled toothbrush and a mild dishwashing liquid or hand soap to wash your denture later. Avoid using toothpaste or other household cleaners as these can easily scratch the acrylic base or porcelain teeth. Make it a habit to clean your denture twice a day and after meals when possible. When cleaning them over a sink, always place a towel at the bottom. If you drop them accidentally, the towel will break their fall and prevent them from cracking. Use your toothbrush to brush away food deposits to prevent stains from accumulating on the base and teeth. Apply the denture cleaner to the brush and moisten it with cool water, then begin scrubbing all the surfaces as thoroughly as possible. Finally, remember to always keep the denture moist when not in use. This will help it keep its proper shape for many years to come. You can let them soak in plain cool water or a soaking solution specifically for loosening and sanitizing your denture. Got a question about making your denture last? Schedule an appointment with a dentist in Cocoa Beach for more advice! Dr. Gary C. Nawrocki is fully dedicated to reconstructive and cosmetic dentistry. He’s completed his Mastership with the Academy of General Dentistry and has been practicing for nearly 40 years. To learn more about his expertise or practice, you can contact him through his website.